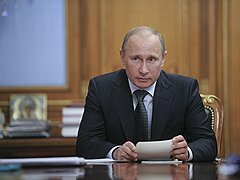 Russia’s developing the continental shelf may become the beginning of “a new high-technology industry of world class and scale” the prime-minister of the Russian Federation Vladimir Putin said in the course of the meeting, which was held on Thursday 12.04.2012. Together with Putin the possibility of the shelf development was discussed by the vice prime-minister Igor Sechin, the Energy Minister Sergei Shmatko, the Minister of Finance Anton Siluanov, the head of Minprirody Yuriy Trutnev, the head of the FTS Mikhail Mishustin, Gazprom CEO Alexey Miller and the President of NC Rosneft Eduard Khudainatov. The prime-minister draw a particular attention to the labour potential of the shelf – its development can create hundreds of thousands of new jobs in Russia, says Putin, claiming in particular that “this industry will create demand for the products of the ship-building, metallurgical, machine-building industries, for scientific developments, for the services of construction companies, which means there will be a complex impact on the whole industry and economy of the country and in perspective this direction of our work will be able to create, without exaggeration not tens, but hundreds of thousands of new high-tech and well-paid job. We speak here about creating two, three and possibly even four thousand of new working places”.